Because telephony is such an open communications channel - anyone may call or text any number at any time - Android users need the ability to easily block unwanted calls and texts. Before N, Android users had to rely on downloaded apps to restrict calls and texts from bothersome phone numbers. Many of those apps either do not work as desired or provide a less-than ideal experience because there are no proper APIs for blocking calls and messages. Some manufacturers might ship their own blocking solutions out-of-the-box, but if users switch devices, they may lose the blocked list completely due to lack of interoperability. Finally, even if users are employing dialing apps and messaging clients that provide such functionality, they likely still have to perform the block action in each app for the block to take effect for both calling and texting. The Android 7.0 release introduces a BlockedNumberProvider content provider that stores a list of phone numbers the user has specified should not be able to contact them via telephony communications (calls, SMS, MMS). The system will respect the numbers in the blocked list by restricting calls and texts from those numbers. 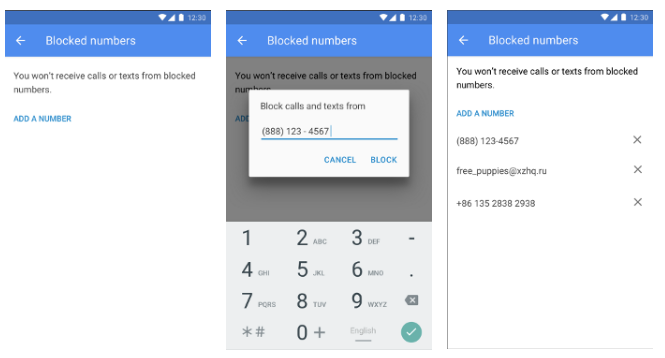 Android 7.0 displays the list of blocked numbers and allows the user to add and remove numbers. Further, the number-blocking feature enables the system and the relevant apps on the platform to work together to help protect the user and to simplify the experience. The default dialer, default messaging client, UICC-privileged app, and apps with the same signature as the system can all directly read from and write to the blocked list. Because the blocked numbers are stored on the system, no matter what dialing or messaging apps the user employs, the numbers stay blocked. Finally, the blocked numbers list may be restored on any new device, regardless of the manufacturer. User will be guaranteed to have a blocking feature that works out-of-the-box and will not lose their block list when they switch apps or get a new phone. All relevant apps on the system can share the same list to provide the user with the most streamlined experience. App developers do not need to develop their own way to manage a block list and the calls and messages that come in. They can simply use the platform-provided feature. OEMs can use platform provided feature to ship a blocking feature out-of-the-box. OEMs can rest assured that when users switch from another OEM’s device that they have a better onboarding experience because the block list will be transferred as well. If carrier has their own dialer or messenger app, they can reuse platform feature for allowing the user to maintain a block list. They can rest assured that the user’s block list can stay with the users, even when they get a new device. Finally, all carrier-privileged apps can read the block list, so if the carrier wants to provide some additional more powerful blocking for the user based on the block list, that is now possible with this feature. If the device had previously never shipped with any additional call/message restriction features, use the number-blocking feature in the Android Open Source Project (AOSP) on all such devices. It is recommended that reasonable entry points for blocking are supported, such as blocking a number right from the call log or within a message thread. If the device had previously shipped with call/message restriction features, adapt the features so all strict-match phone numbers that are blocked are stored in the BlockedNumberProvider, and that the behavior around the provider satisfy the requirements for this feature outlined in the Android Compatibility Definition Document (CDD). Any other advanced feature can be implemented via custom providers and custom UI / controls, as long as the CDD requirements are satisfied with regards to blocking strict-match phone numbers. It is recommended that those other features be labeled as “advanced” features to avoid confusion with the basic number-blocking feature. The BlockedNumbersActivity.java user interface provided in AOSP can be used as is. Device implementers may also implement their own version of the UI, as long as it satisfies related CDD requirements. Please note, the partner’s PC application for backup and restore may be needed to implement restoration of the block list by using BlockedNumberProvider. See the images below for the blocked numbers interface supplied in AOSP.